Poli (Boli) is a traditional indian sweet stuffed with coconut, jaggery, channa dal and rolled into a flatbread. It is one of the special dishes prepared during the Tamil festivals Bhogi, and Avani avittam. It is also known as Puran Poli (North India), Obbattu (Karnataka). Mix maida, gingelly oil, salt and turmeric powder sprinkling little water. Dry roast gram dal till golden brown and soak in water for an hour. Grind it along with scraped coconut. Now add the jaggery and cardamom and grind again. (Do not add the jaggery in the beginning). Heat a heavy bottomed pan, saute the above ground mixture and stir till it is thick like a ball. Take a banana leaf or plastic sheet. Take out a small ball of the maida dough, spread it with your hand. Wrap the jaggery mixture with dough and again spread it with your hand. Heat a tawa, smear it with ghee and place the poli on it. Drizzle ghee to the sides. Serve hot with some more ghee spread on the top. Mix maida, salt, turmeric powder and water. Do not use gingelly oil for the dough. This dough will be like chappathi dough. Roll out chappathis, place the filling and cover. Roll again using a roller. Other procedures are the same. Happy Pongal, poli sounds good. Enjoy. wow!new recipe to me looks great! Wow yummy poli's looks so tempting . I love it. 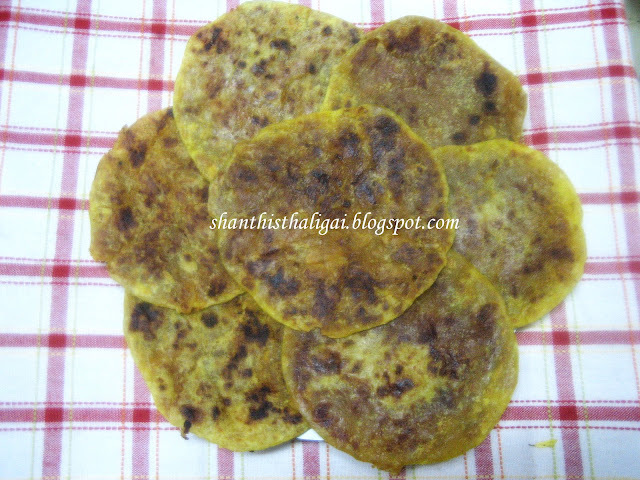 Maami - looks wonderful - I was planning to make this sometime this week for Pongal too. I'll use your recipe - looks great! Poli looks delicious, one of my favs! The poli looks absolutely yummmmmmmmmmmm. Poli looks delicious :), I luv Poli! very nice shanti.... happy pongal ! Shanthi Maami - I made polis for Pongal this time and your post was as always a huge help. I've even linked it in my post. I used your method to make the poornam and loved it. Happy Pongal to all of you! Thanks so much for the descriptive poli preparation. I have always prepared poli by first boiling kadala paruppu, grinding it with vellam and then heating the mixture to get pooranam consistency. Your recipe appears very simple.